Use the code chr1stm4s to knock 20 percent off tickets before January 5. 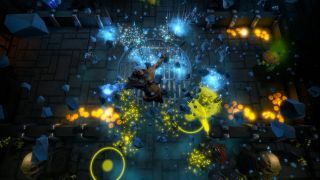 Firefly Studios is bringing its "rock hard" dungeon crawler MetaMorph to the PC Gamer Weekender, showing off the shapeshifting action that allows players to shunt between different souls (abilities, basically) to crush their enemies. Expect exploration, tactical arcade combat and customisation—this is one that’s looking to be an interesting take on the dungeon crawler genre. You can find more details about Metamorph over on the game’s official site, or via its social media presence on Twitter and Facebook. And if you want something more visually stimulating, check out Firefly Worlds’ YouTube channel right here. MetaMorph will be joined by many more speakers, games and booths, all at the PC Gamer Weekender, which is being held February 17-18 at the Olympia, London, in the UK. For more details see the site, and follow us on Twitter for up-to-the-minute news. Tickets are available now from £12.99, and you can get 20 percent off if you use the code chr1stm4s before January 5.